The global CEO of Philips Electronics Sri Frans Von Houten visited India recently. Sri S. Muralidharan, President, Ekal Educational & Charitable Society (EECS), SVO of Kerala took an opportunity to interact with him. Sri S. Muralidharan made a video presentation to the CEO to explain how inequality exists in the Indian society between those born in cities/towns and those born in rural areas, and how the 'Ekal Movement' has been making a huge impact to bridge the gap between the urban and rural, by providing informal education to the children through Ekal Vidyalayas (One-Teacher Schools). Sri Frans Von Houten was quite impressed with the initiative of Ekal, and in a spontaneous gesture he announced to sponsor 100 Ekal Vidyalayas. EECS gratefully acknowledges and applauds his magnanimous response and welcomes Philips to the Ekal Movement. Vindyachal Bhag of Ekal Movement organized a programme on the occasion of World Environment Day at Chunargarh Anchal on June 05, 2012. Sri Krishna Kumar from ‘Hindustan’ newspaper presided over the programme. Former chairman of Chunargarh, Uttar Pradesh Sri Vijay Verma and Sri Uday Pratap, Kendriya Swabhiman Jagran Pramukh (Central Empowerment Head) of Ekal Abhiyan were the main speakers. All the participants took a resolution for cleanliness and uninterrupted flow of the river Ganges. The programme was covered by many local newspapers and published a wide coverage on it. Anchal Samanvaya Varg (Camp) of Manipur Anchal was held at Imphal on April 22, 2012. Executives from Anchal Samiti (Area Committee), Sankul Samiti (Sub-area Committee) and Sanch Samiti (Cluster Committee) and fulltime workers actively participated in the camp. Many supporters and well wishers of Ekal Movement also participated in the camp. Sri Subhash Agarwal, Chairman, FTS East Zone, inaugurated the Varg. Children from Ekal School performed prayer and welcome song which impressed everyone. Sri Prem Narayan, Treasurer, Manipur Anchal Samiti, presented welcome address. Sri Pawan Agarwal focussed on the points which has to be taken care for conducting Ekal Movement. He also focussed on the role of Anchal, Sankul, Sanch Samiti and fulltime workers of Ekal. Sri Subhash Agarwal called upon all the urban people to support Ekal Movement. Senapati Anchal Samanvay varg was successfully organized at Charhajar town of Senapati District (Manipur) in the first week of May 6, 2012. Sri Arun Bajaj, National Vice-President, Friends of Tribals Society, inaugurated the camp. Spiritual leader of Senapati Pt. Badricharan Khatibada, Sri Ajita Jana and Sri Sapan Mukherjee from Ekal, Sri Thanmal Doogad from Imphal honoured the camps by their auspicious presence. Mr. Sapan Mukherjee spoke on Ekal education. Sri Arun Bajaj described the problems of North East region. He said that only development education can solve all these problems. We all need to work together for the progress of our nation. He pointed out all the problems in running the schools in these areas. Guruji Pt. Badricharan Khatibada gave his blessings. Sri Ajit Jana gave the vote of thanks. Ekal organized two day training camp at Matekheda Ekal village of Rajnandgaon District (Chhattisgarh) on April 13-14, 2012 to promote Organic Farming. 80 villagers took active part in the training. On first day, District Assistant Agriculture Officer Sri R.L. 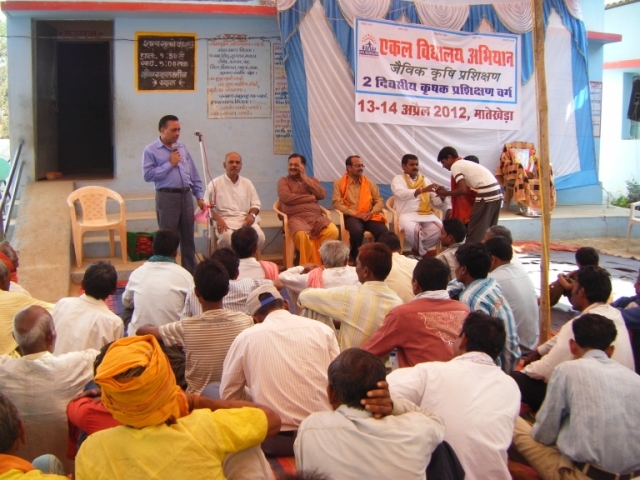 Khare provided detailed infromation about Government schemes and Organic farming to the farmers. Sri Pradeep Swain, Ekal Gram Vikas, Sri Buneshwar Sahu and Sri Bhupendra Katlam from Ekal attended the camp. Mahila Samiti of “Friends of Tribal Society” of Odisha celebrated its annual function in Modipada, Sambalpur on April 01, 2012. Swarninad Group from Kolhapur, Maharashtra; performed 'Jago Hindustani' on the occasion. Smt. Prema Pansari welcomed Chief Guest, Smt. Deepali Gupta, President: Women Welfare Organization, East Coast Railway, Chief Speaker, Dr. Purusottam Agrawal, Smt. Kiran Devi, President, Ekal Abhiyan Mahila Samiti-Sambalpur, Sri CK Saraf, President, Marwari Sammelan and Ekal Abhiyan. Chief Guest, Smt. Deepali praised Ekal Movement and said in today's time a child can get an education through a small donation of Rs.500/- per year. She promised to actively support the - Mahila Samiti in collecting funds for the Ekal cause. At the end 'Jago Hindustani', a dance drama, directed by Prof. Suresh Shukla, was performed by 26 artists of Swarninad Sangeet Manch, Kolhapur. The patriotic music - show was amazingly heart-touching and mesmerizing that kept audience enthralled.